C.J. Cherryh has penned both science fiction and fantasy tomes (as well as the blended Science Fantasy that partakes of both) and much of her significant sci-fi output has been in multiple series that span time, space, and in some ways even genre. And yet all of her works are part of a much larger future history of mankind amongst the stars: Angel with the Sword is the first book of the eight-book MEROVINGEN NIGHTS series, as well as a peripheral part of Cherryh’s ALLIANCE-UNION universe. I love the idea of sprawling future histories with room to really explore differing political, ideological, and personal aspects of the human condition, along with all of that cool what-if technology, and even crossing into other genres (like science fantasy). I say that I like the idea of it because I have to admit that, up to this point, I have yet to find a future history series that has really clicked for me. While I would classify this book as science fiction it looks much more like a fantasy at first blush. The culture of world of Merovin appears to be something analogous to the late Renaissance, but Cherryh makes clear from the start that this is a fallen colony world that no longer has access to the high technology of the space-farers who were the colonist’s ancestors. These colonial descendants have not forgotten whence they came (though at this point most of the details are lost), so this isn’t a case of a primitive world that views technology as magic. However, technology is strictly limited due to lack of knowledge, limited resources, and most importantly a set of cultural restrictions that have become part and parcel of what it means to be a Merovingen citizen and which harken back to the catastrophes that brought about their separation from the rest of the Human race. In Angel with the Sword, Cherryh has in some ways taken what would be considered a traditional approach to her cast of characters and turned it on its head. The character of Mondragon (an aristocratic, sword-wielding figure of authority embroiled in high politics and nation-shaking events), who in almost any other sci-fi/fantasy work would have been the hero, is instead the secondary character. 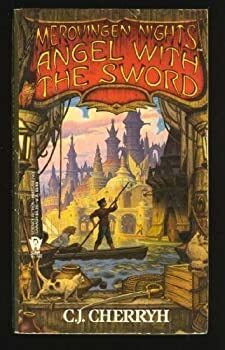 The narrative centers on the person who would normally be the sidekick: Altair Jones, a lowly skip pilot barely eking out a living by moving illegal freight across the canals and rivers in the Venice-like city of Merovingen. To add to the inversion, Mondragon is the one who needs to be saved by her, which certainly makes for an intriguing story as we follow Altair in her attempts to navigate both the lowly ‘canal-side’ world on the periphery of the criminal underworld with which she is familiar as well as the ‘hightown’ world of aristocrats and power brokers in which she is a true fish out of water. The detail with which Cherryh builds the world of Merovin is impressive. She makes use of an introduction to set the scene as well as an appendix at the back of the book to give greater details to interested readers. Her world-building within the context of the story proper, however, is done without resort to the dreaded info-dump and she trusts the reader to gather the pieces left through passing comments and references made by characters, such that details of the broader picture can be distilled from the context in which they occur. I was most impressed with the vivid picture she painted of the life of Altair herself. It is a life that has been mostly hand-to-mouth where many things we would likely consider to be necessities are, for Altair, the greatest of luxuries to be obtained only in the rarest of circumstances (such as sugar for one’s tea). We are never bashed over the head with this, but simply come to appreciate the kind of life that a canaler on Merovin can come to expect. This comes into even greater focus as Altair is drawn into the hightown world that Mondragon calls home. What ensues is a cat-and-mouse game of conspiracies and mysteries set against the backdrop of a hard-scrabble world that has lost everything but hope, and even that hope is of a rather callous sort. The real star is Altair Jones, an extremely well-drawn heroine who thinks and acts in ways that make sense and allow her to seem like a real person, not a literary archetype or a plot element. The world we get to live in for a short time is intriguing and colourful and certainly held my interest. The plot was intricate without being convoluted and was certainly strong enough to bear the weight that the world and characters demanded. The long and the short of it is that this book leaves me with a desire to read much more of Cherryh’s work and a sense of anticipation at what I might find there. That, my friends, is definitely a good thing. This sounds fairly interesting, and I assumed it was straight-up fantasy based on the cover artwork. Surprised it went to 8 volumes, actually.